Anywhere Return/Exchange function of the ETP Omni-channel Store Solution enables you to extend an enhanced customer service to your end customers, whether they buy through e-commerce or at your physical stores. Your customers can now buy products online and return or exchange them at the nearest store or buy in store and trigger an online return or exchange or have it collected from the desired location, irrespective of the channel of purchase. Returns can be accepted at the store and the in-store inventory balance updated instantly using the ETP Store Inventory Management function. Purchases can also be made from customers and these are called Buy Backs. In case of Buy Backs, a credit note is generated for the customer using which customers can do purchases from the ETP Store Front. 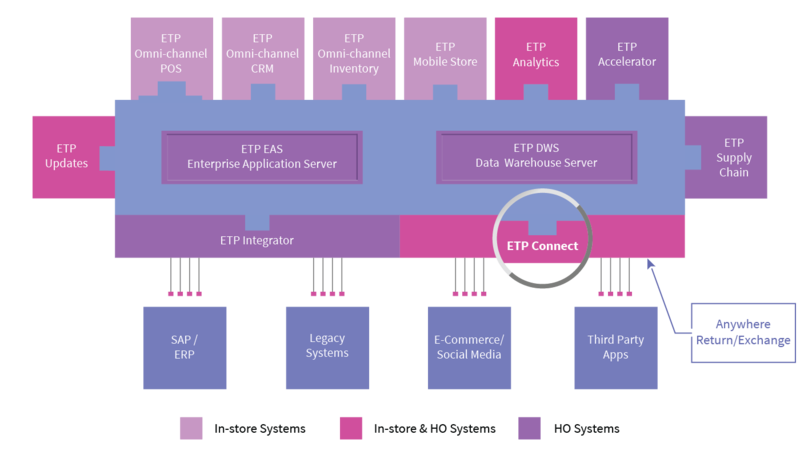 All this, seamlessly enabled with the ETP Store and ETP Connect Web Services framework.